WARNING: Your Car May Be In Danger! Ever wonder why your paint appears to have millions of little spider webs on the paint when you look at it in the sun. This is what we call "swirls" in the detailing world. Swirls are actually millions of microscopic scratches in your paint from improper washing technique. When you take your car to the car wash, they use the same old wash mitt with the same old dirt from the fifteen other cars before it! Rubbing dirt into your paint is obviously going to scratch it. At AC Auto Spa, we use wash techniques that prevent such swirls from being induced into your paint and we also specialize in the removal of swirls. You would be surprised at how much more rich your paint looks with all of the swirls gone! Feel free to ask us more about swirls and how they are removed. CLAY BAR : When your car sits outside all day, pollution and other contaminants fall from the sky and the surrounding environment onto your cars paint. While it may appear that your car is clean after it has been washed, if you go ahead and feel the surface of your car, it will most likely feel somewhat gritty. 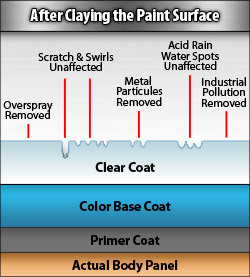 This is because microscopic parts of contaminants bond to the paint and can only be removed by a clay bar. A clay bar is not abrasive at all. The clay bar is glided across the surface of the panel on top of clay bar lubricant. 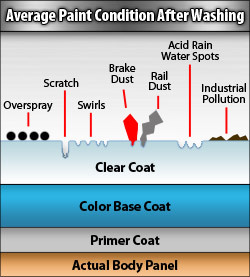 The bar then "pushes off" or loosens the contaminants bonded to the paint. To get your car looking its best, it is suggested to get a clay bar treatment and your paint will look and feel as smooth as glass.